How Can You Afford Improvements To Your Home? the value of your home. However, there is typically a lot of upfront expense involved. How can you afford upgrades to your home? At Ultimate Roofing and Construction, LLC, we offer financing through GreenSky®. GreenSky® offers financing plans for all customers, staged funding, high approval rates, and great credit limits. Whether you want to pay using a deferred interest plan or a fixed monthly budget, the GreenSky® programs offer flexible consumer financing options to meet various needs. Additionally, with their wide range of bank partnerships, they are able to approve more applicants, allowing more home improvement dreams to come true. GreenSky® offers flexible terms, convenient payment options, and no prepayment penalties. From 12 months with no interest or payment to an APR of 9.99% for 96 months, there’s a wide range of credit plans to choose from without any prepayment penalties. Additionally, with a paperless process, fast approvals, and same-day financing. the application process couldn’t be easier! So what’s stopping you? Choose the home improvement project that is best for your home, and begin a plan with GreenSky®. Whatever project you choose, we can help! Not just with construction or repairs, but with financing too! For more information on our services or financing, contact us today! 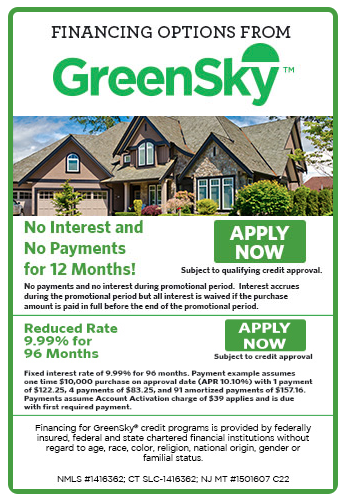 If you're ready to apply for financing with GreenSky®, apply here!